Beautiful Incentives: Vintage style owl necklace, pendant for $1.15, INCLUDING Shipping! Vintage style owl necklace, pendant for $1.15, INCLUDING Shipping! 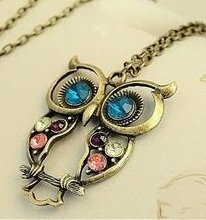 Adorable vintage style owl necklace on Amazon. Very big pendant necklace, and it has lots of GREAT reviews! Trustworthy seller, so i'd jump on it now! $1.15 including shipping and handling!